Amish Tripathi now enjoys a celebrity status in literary fraternity. He have achieved it of course. With back-to-back 3 best seller books made him eligible for the same. He have tried a unique approach in writing, that is, looking at the mythologies from the modern day eye. Or rather we say, absorb the mythological stuff about mythological characters / Deities like – Lord Shiva – from various sources, and restructure them for the modern day readers. He humanizes the mythological characters, and he does it pretty well. In fact the motto behind the first book of the Shiva Trilogy – Immortals of Meluha – was something like this – “If Shiva was a man of flash and blood like us and he actually wandered through the canvas of ancient India…“. Amish is a marketing genius and he oversee successful campaigns for all three of his books (published so far). “Video Trailers about the book” concept worked pretty well for him. He also travels various cities and bookstores to create hype and awareness about his book(s). His latest offering is – Scion Of Ikshvaku which is to be released on 22nd June 2015. It is considered as the first instalment of a series of books he planned on having the similar take of – Lord Ram – aka – Lord Rama’s life. He successfully launched the trailer of this book and made readers curious about his book. 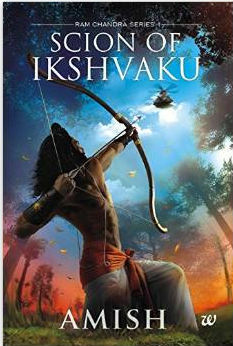 Scion Of Ikshvaku – is in talks since months and the awareness about this book in readers reached to the milestone decided. This time Amish went ahead and released a chapter – Chapter 3 to be precise – for the readers who pre-ordered the book (Kindle edition). It gives the readers a glimpse of what to expect from the book and it will also result into spreading the word of mouth by the readers who enjoyed it, to the others. And, the pre-ordering readers will feel privileged too. Here is a brief summary of chapter 3, and our views about the same. Please expect no spoilers. This chapter explores one of the most important event of the book. That is Birth of Ram. The major part of this chapter is focused on a war being fought on. The chapter also re-instates (more than once) – the meaning of Ayodhya (unconquerable, cannot be fought with) – the kingdom of Ram. Dashrath was fighting an important war against Kubeir and Raavan, having Ashwapati in his side. The chapter also explores the political insights of “inside the palace” politics, a little. Amish is good at describing war plans, techniques and fighting. He does the same here nicely when he talk about the “Suchi Vyuha” – a needle like formation. In Shiva trilogy series Amish talked a lot (nicely) about war-ships and the battles at the banks, here also a similar war is going on, and you might get feeling of – deja vu – while reading the war. There are some gems of writing found in the chapter here, but we will rather mention them while reviewing entire book. There are modern day phrases like “adrenaline pumping” used in the chapter which may look out of focus (in terms of time, the book covers), and author could have used another word when talking about “doctor” attending Kaushalya. Another important thing to get from this chapter is – one must have control over his emotions while fighting a war. Never consider yourself superior, or think low about your opponent. Don’t overestimate your powers (and underestimate the opponent). The presence of mind and open-minded approach is always required to fight and win the war. The chapter is written in author’s signature styles and his target readers will find it up to expectations. Are you curious to read this book? What are the other books of Amish Tripathi you did already read? Have you already pre-ordered this book, and read this free chapter? You are invited to share your thoughts via comments below.